It's Real: It's RED again! I changed my hair color again. I love color and my consultant loves it too! Sunday she put in the RED and today we added the BLONDE streaks. Lets see how long this will last. I'll have more photos soon. I've always wanted to try red...looks great on you! The new color looks great, and I love those highlights! Now matter how you change the color, it always looks slammin to me. Very cute indeed. Your color looks great. 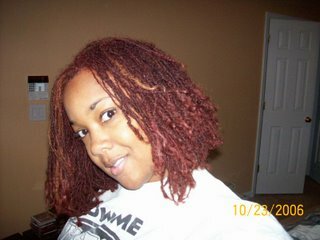 I can't wait til I can color my hair. I may try a reddish-brown. I love all your colors! I'd love some on me, but I'm too chicken to try. Your color is beautiful, and your hair is gorgeous. 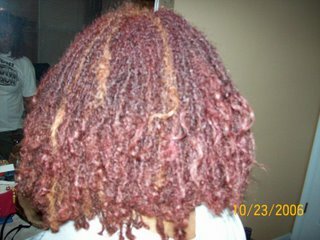 I live in Lithonia, GA. Who is your SL consultant and who did your fabulous color? I have a SL consultation, on Tuesday, October 31, 2006. My consultaion is with Tressi, she is located in Conyers, GA. 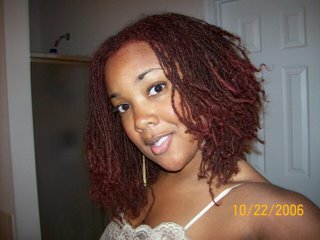 I have been natural for 6 yrs. 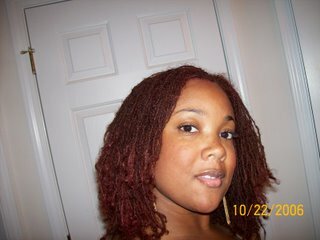 now, and have previously had locs. I am definetly ready for SL. Keep up the great look. I go to D. Ali in Atlanta. 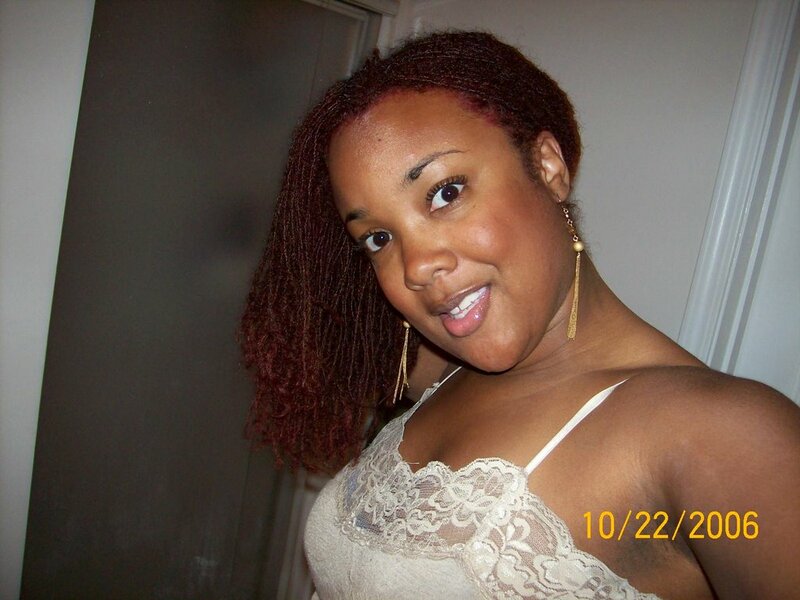 She is on the Sisterlock website listed under a Lithonia address. She did the color also. Hi, Dacella again, golden 08 did you have to pay a consultation fee? Golden 08 are there any SL groups here in Atlanta that I could join, or groups that you are a member of? I had another consultant when I first started; however, she retired from Sisterlocking and that is how I found D. I think D's consults are free but don't quote me on that. I'm not a member of a SL group here in Atlanta because I don't know of any...that is something I was thinking we need here in the ATL. We should try and get a SL group going here in Atlanta. I think it would be a great thing. Your hair colour and hair always looks fabulous. I have had my SL for one and a half years now and i want to clour it in November. is there a particular brand of colour that you recommend? what brand do u use?